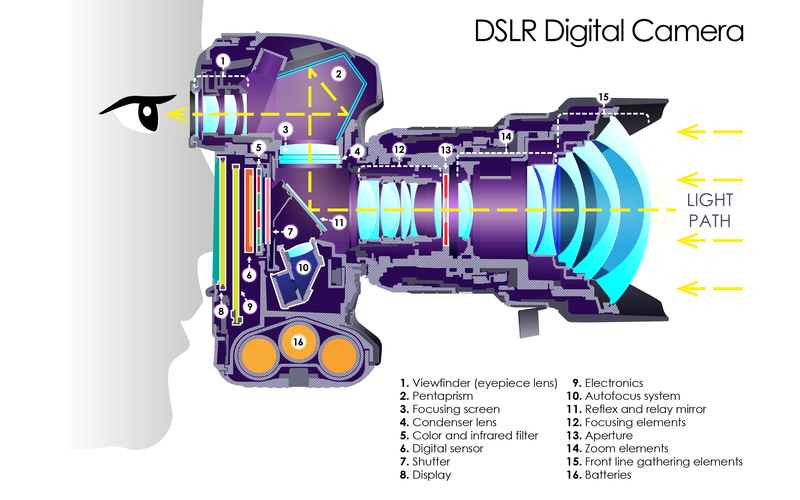 Ever wondered how your DSLR camera actually works? This illustration from Gurucamera shows a cross section of a DSLR camera, allowing you to take a look at the camera’s inner workings. Light enters the lens and is reflected by the mirror , through a pentaprism , and into the viewfinder . This means that the image you see in the viewfinder is an accurate representation of the picture that will be captured by the camera. When the shutter is depressed, the mirror flips up and allows the camera’s internal sensor  to capture the light. If you’ve ever noticed that your viewfinder goes black for a split second when you take a picture, that’s why! When the mirror is flipped up, there is no light reflected into the viewfinder. Of course as soon as the image has been captured, the mirror flips back into place and you’re ready for your next shot! So, that’s how your DLSR camera captures an image. Simple right?